How many of us learned to shoot as kids on a .22 rifle? Most of us did our share of plinking at cans and paper targets growing up on one. The Ruger 10/22 is one of the most popular .22 rifle ever made, and many of us have one in the corner of the safe from the good ole days. Still, exciting isn't the first thing that comes to most grown-ups' minds when they think of the .22 caliber round... Well, that was until RedJacket Firearms of "Sons of Guns" fame held a "Zombie" killer challenge in Season 4 Episode 3 and gave birth to the RedJacket ZK22 (Zombie Killer .22), turning your everyday awesome Ruger 10/22 into a Zombie Freak Killing Bullpup design that is just about the only thing that could have added more fun to the movie "Zombieland" than the original. I personally like bullpup designs a lot, given that they are compact, lightweight, manageable and well balanced. When it comes to bullpup designs though, they all have a common challenge to overcome, the trigger. 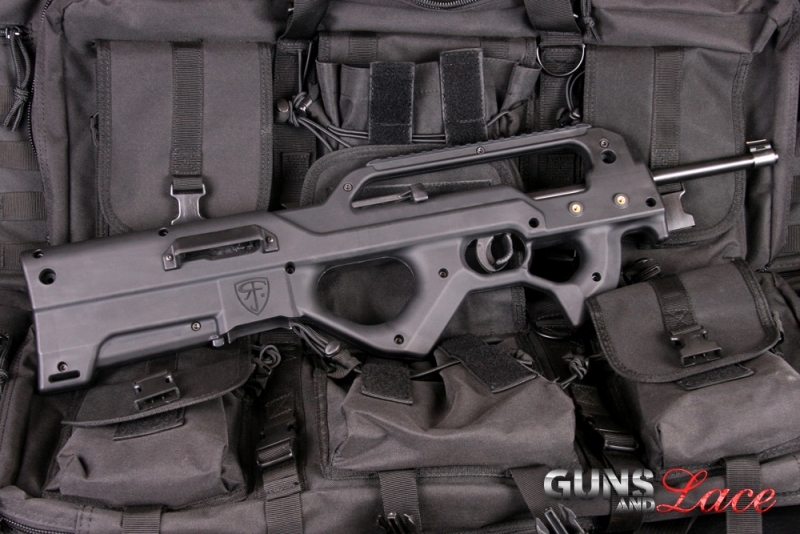 By design bullpup conversions move the action and barrel back and into the stock. maintaining barrel length but hiding much of it in the stock. This usually requires a trigger bar rod that ties the original and new trigger assemblies together that often has a lot of give or slop associated with it. Sloppy triggers are not a good thing to say the least. Along comes Joe Meaux from RedJackt with a serious eye towards properly engineering the trigger set up, he created a nested bar and Voila, a seriously sweet trigger on a bullpup .22 is created and housed in a cool looking poly stock, with a purpose to kill zombies and look super cool doing it. I was impressed when I opened the package for the stock at how well reinforced the poly was, it looked like the Eiffel Tower inside with the number of struts, girders and crosspieces in it, the end result being there is no give or flex in the ZK22 so it stays on target and is accurate as sin. We shot ours with a VORTEX Strikefire sight on it and took out every zombie in the place like a mad vigilante in a graveyard on Halloween night. The most fun was had out in the woods kicking up cans at 10 to 50 yards rapid fire. Let's just say that no undead pop can survived. There is a place on either side for a Mag pull accessory rail to mount iron sights or a flashlight and a Picatinny rail on top that serves double duty as a scope mount and carry handle. The charging handle is on top, and the unique trigger safety easily accessible in the trigger guard. The assembly was easy, I just watched the Youtube video Joe did and followed the directions. There were a lot of screws (good for rigidity, tedious for cleaning) and the rest was drop in and go. If a girl can do it, guys...you can do it! I didn't even break a nail! The only challenge I encountered was that the charging handle was a bit sticky, but after a quick conversation with Charlie Watson at Redjacket, and at his suggestion, working it back and forth a bit and then adding a little graphite, charging the rifle is now silky smooth. 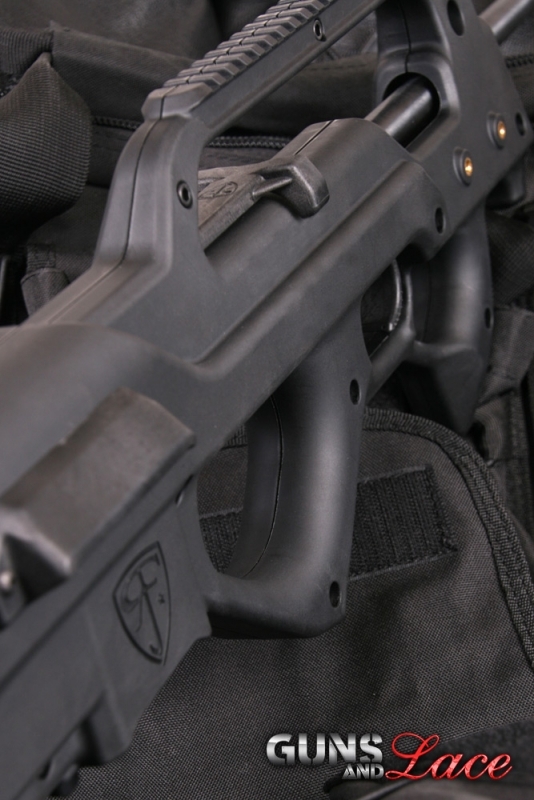 Everyone who has seen our review ZK22 stock kit on the Ruger 10/22 has commented on how cool it is. This stock kit is just plain FUN! While we all know there is a lot of hype and drama in reality TV shows, do not kid yourself, the Hayden's and the rest of the crew over at RedJacket firearms are approachable, helpful and committed to producing quality firearms and accessories. Favorite Quote: "I'll give you my gun when you pry it from my cold, dead hands." Guns and Lace girl Cristina Corina is a woman that is proficient with firearms. She is a retired police officer that served a total of 15 years on the force. She and two other officers were wounded in a hostage situation on the Santa Monica pier July 4th, 2000. Doctors were concerned they would have to amputate her arm, but after considerable surgery and advising her she'dn't be able to regain much use of it, Cristina battled back with physical therapy and exercise to return to the police force and serve an additional 7 years before retiring. She is a survivor, so much so, that she was approached to be on "Survivor: Cook Islands" TV show and spent weeks living off the land while a crew filmed her struggles. She worked with Jennifer Lopez as a technical adviser on the movie "Angel Eyes." Cristina lives in Southern California and spends her free time fund raising for charitable organizations. She is currently in the process of creating a foundation of her own, called Charity Unlimited. She loves swimming, traveling, networking and connecting people together so they can help each other. Did he use a 22. Revolver? WHAT HAPPENED TO THE SHOOTER? Hey one spot you say she is single and another that she got married. Which is it?